We end the week with a little tune about a cat named Spim called "Spim Likes Good Music". 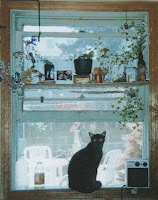 Spim was a cat that was with Jay for years - while we were roommates and was Rain Station's official mascot. 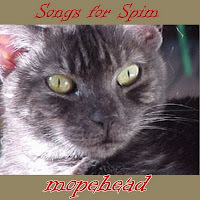 I recorded a CD about Spim - "Songs for Spim" - some songs were for that CD specifically while others made it onto the CD based on subject matter (or Spim meowing on the track). When I lived with Spim it was always fun to record with mics since you'd never know when she'd sing along. She loved the recording process and would spend her time sitting by me when I'd record music. She appreciated the arts. I know Jay misses her. I miss her as well. I don't know that there will be another cat like her. I like to think that she's out there in the kitty spirit world watching over Jay and I, enjoying our music...liking good music.